this is my first time having a kid in school – and i’m learning a lot! i’m learning how to get organized in the morning so we can all get out the door on time with smiles on our faces! i’m also learning that homework time can be difficult, especially if there are other things going on in the house that might be distracting – the tv might be on, i might be making noise in the kitchen, brother might be playing with toys upstairs, etc. who wants to do homework when there are so many other things going on around you? so, we tried out this homework station to see if it would help with the disaster that is homework time. 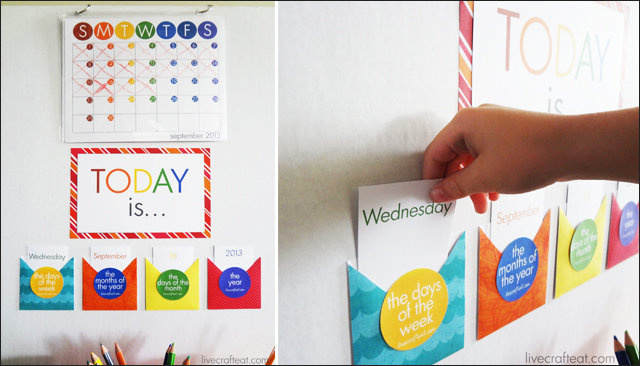 last week i posted these colorful free printable calendars for kids. i printed out each month onto white cardstock, put them each in their own page protector and attached them to the display board using 3 book rings. 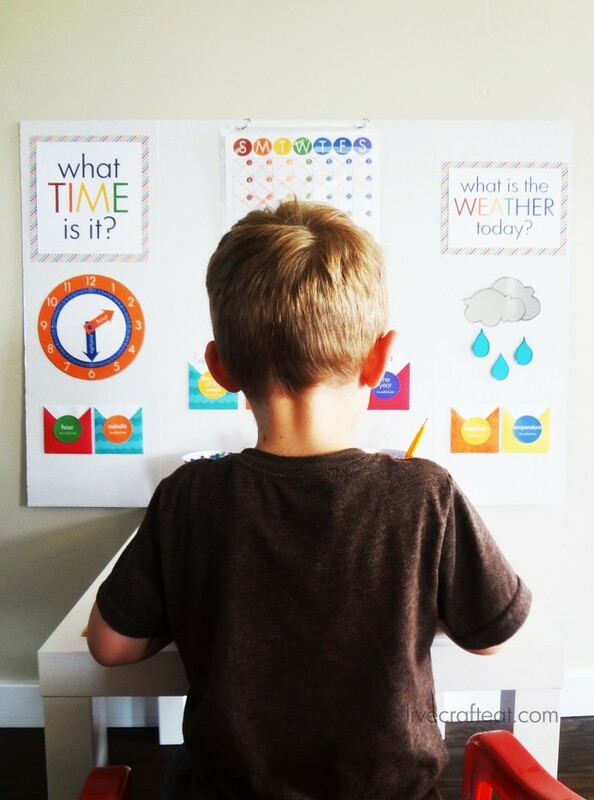 we use dry-erase crayons, the same ones we use for his dry-erase activity book, and each day he gets to cross of the current date on the calendar after he’s done his homework and 20 minutes of reading. i printed out a title (you can print the “today is…” title here), and mounted it onto patterned cardstock and used double sided tape to attach it to the board. to make the sleeves to put all the cards into, i just took an envelope, sealed it, and cut it across the middle just shorter than the cards themselves. next, i cut the front side of the envelop with a “V”, glued scrapbooking paper onto it, then cut the “V” shape out again – after doing a few of them i realized that i could just glue the scrapbook paper on before cutting the “V” in the front and then i wouldn’t have to do it twice. duh. please learn from my mistakes. print out these circle labels to attach to each one so you can remember what’s supposed to go in it. 2. weather section: for this section, i printed a title (you can print the “what is the weather today” title here), and made the envelopes (see instructions above). for the weather symbols, i just drew some clouds, raindrops, lightning, sun, & snowflake with a grey marker onto the appropriate colored cardstock. after laminating them so they would last longer, i put velcro dots on the back of the weather symbols and also onto the board so they could be added/removed – depending on the weather. you’ll also need to print these weather & temperature cards. 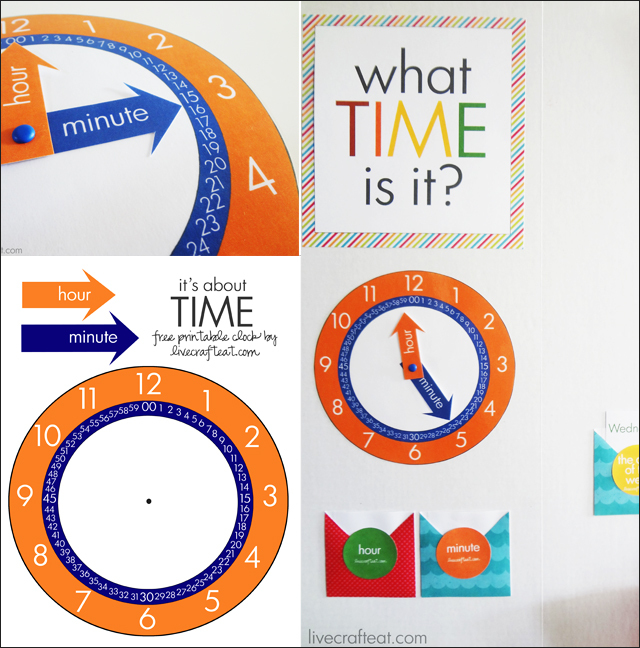 3. time section: i posted a free printable clock last week that we’re using to help him learn to tell time. the orange arrow corresponds with the orange numbers (hours). the blue arrow corresponds with the blue numbers (minutes). also, the number “60” is replaced by “00”, so that he can learn to write time as “6:00” and not “6:60”. so whenever he starts his homework, he changes the clock to that time. when he finishes, he does the same. how long did he work for? let him tell you! after that, you just need the title (you can print the “what time is it?” title here), and the envelopes (see instructions above). it will be easy for you to make your own, too. 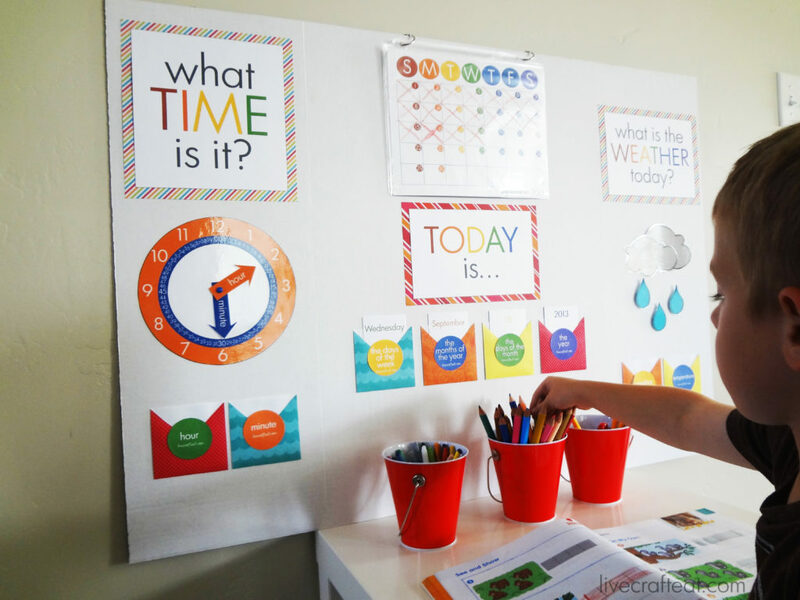 just get your hands on a tri-fold display board (i’ve even seen some at dollar stores!) download all the printables above along with the ones in the printable calendar post and clock post, make the envelope sleeves, and you’re good to go! 2014-2015 school calendar for kids :: freebie! Katie, you have solved some problems for me! We have been doing days of the week, months of the year, and a calendar and it has been going well. BUT I was feeling like I needed an easier way to pull together the “Today’s Date” part without just pointing all over the place like, “Today is (point to day of the week) Monday, (point to the top of the calendar) September, (point to the day on teh calendar) … etc.” I really like your envelope pocket idea- I’m definitely going to try it! Also, I reallly like the way you did your clock. I am going to try this with Talia. She can sort of tell time, but still gets messed up sometimes, and I think the way you set up your clock (showing the minutes and colour coding it) will be helpful. Thanks Heather! I’m glad you like it! I know what you mean about calendaring – all the info’s right on the calendar itself but it’s hard to show them how to jump around all over the place just to get the whole date in the right order! I’m going to try to get him started in writing his name AND date at the top of all his homework sheets. Hopefully the practice and repetition that way will help, too. love, love, love this. i’ve wanted to do something like this for our homeschool room, but well you know, i never got around to it. now i don’t have to — it’s all done and super cute. thanks. katharine. Thanks, Tiffany! So glad you like it! Katie thankyou so much for solving a problem for me and I don’t have children!! Katie I LOVE these, my son has been having problems understanding the the breakdown for the calendar and being able to use this at home plus what his teachers use is great!! I love the weather section, but I wish I had cards for temperatures lowers than 60 degrees! For the life of me I cant figure out how to make these cards! thanks for the comment! i’m glad you like the printables! i’ll work on making more temperature numbers and will let you know when they’ve been posted. thanks! Thank you for this idea. Do you have any ideas for older kids, 10 and up? Hi Stephanie! I’m glad you like it! Unfortunately, I don’t have any ideas for older kids, I’m sorry. I am so excited to try this project. My daughter is starting pre-school on friday and I really want her to have a space of her own. I am a complete organization freak so this is completely perfect for us. Thank you!! do you have a editable version? I’ am portuguese, and i love this project, but i would want put portuguese words in it. Hi Carlos! Sorry, I don’t have an editable version. I hope you’re still able to find a way to use it! this is perfect thank you for the downloads! question, what are you using to stick the items to the chart for on and off again? Hi Katy! I just use self-stick velcro dots. they work great! Wow, this is perfect for our homeschool room! Thank you so much for offering this to others! It’s so simple and cute! My girls will love it! I’m so glad you like it, Jami! Great templates! Thanks!! The pockets for the hour, minute, and temperature; what do you put in them? And I am guessing that the weather pocket holds the different weather cut-outs to pin up? Hi Miranda! There are “time cards” as well as “weather & temperature cards” that you can download – the links are in the post. Is there a printable for the 2016 version of this for the calender? 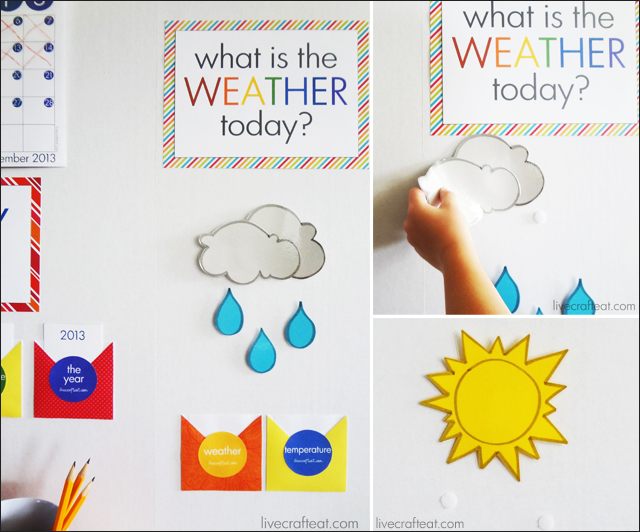 Do you have a printable for the clouds and sun? I did not see it listed. Hi Jess! I don’t have printables for those – I just cut them out freehand out of colored cardstock and then went around the edges with a marker. it’s okay if they look imperfect – the more hand-drawn looking the better, imo! 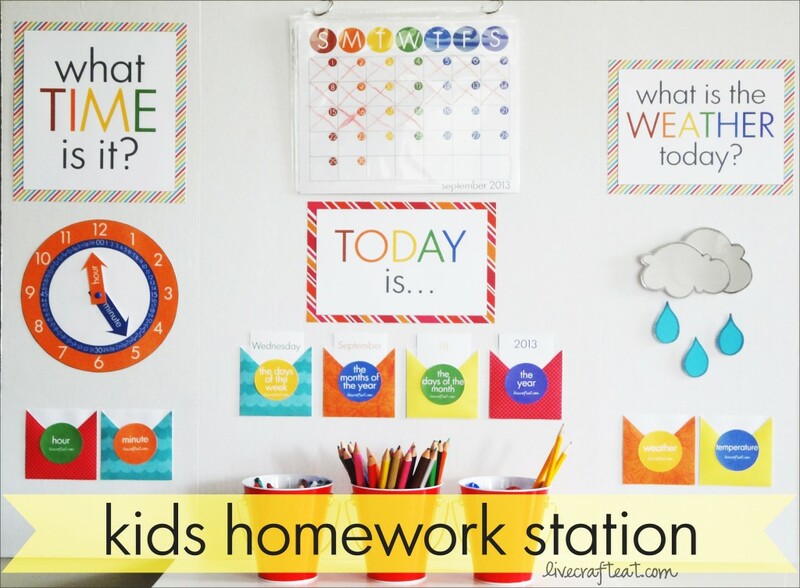 I love this homework station! I was struggling looking for a way to put the date all together and I just found you! And it looks really nice for the kids attention on the important words. I will use it in my junior English classes in the school in Catalonia (Spain). I’m so happy you like it! Thanks so much for letting me know, Elisabet! !